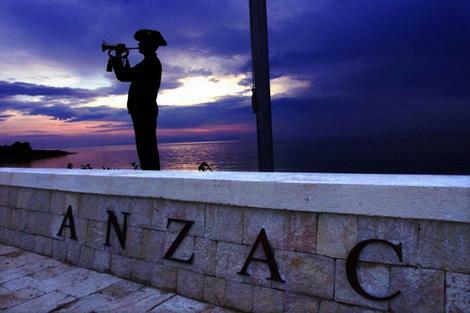 In the last warmth of a setting sun I finally start to understand Anzac Day. Sitting high above the stunning but harsh Turkish coastline staring out at the beautiful Aegean Sea, the feeling that I thought would be instantaneous at last arrives, sending shivers down my spine, chilling me to the bone. I, like so many of the thousands that have gathered a few kilometres away at North Beach, have crossed the world to experience Anzac Day at Gallipoli, a place we hold so very dear to our hearts and an increasingly popular destination for young Australian and New Zealand travellers. Most have arrived on the peninsular via bus from Istanbul, joining one of the countless tours that operate to service the Australians and New Zealanders that have made the pilgrimage. Though Istanbul is not the capital of Turkey, it is the centre of almost everything that happens in the country. It is an amazing blend of cultures: a melting pot of history and religion that rushes at you from the moment you arrive. Its position, which lies on the border of Europe and Asia, ensures that it is also a place of immense contradiction. A kind of organised chaos engulfs the majority of the city, as taxis, buses and a never-ending mass of people stream past at a million miles an hour. I couldn’t help but feel uneasy at times as my steps often seemed hurried, almost as if I slowed for one second I’d be swallowed by a monster I never actually saw. The Sultanahmet area, which is the tourist hub, is in great contrast to this. The old town, although lively in the nights leading up to Anzac day, is for the most part a relaxed, almost timeless place, defined by its cobbled stone streets and weathered historic buildings. Though the days flew by swiftly, the nights were increasingly long as the roof top bars filled with Australians and Kiwis about to embark on their Anzac adventure. With so many keen to meet their countrymen and women and sample a few of the Turkish beers, friendliness filled the air like I’ve rarely felt before. The party atmosphere has well and truly dissipated by the time the masses converge on the Gallipoli peninsular. The feeling, although still light-hearted, is one of resounding respect and before dawn arrives on the 25th and brings with it the most haunting silence you will ever hear, the number of visitors to this sacred site would swell to almost fifteen thousand. Either bunkered down on the hill side that gently slopes towards the ocean or rugged up in the grandstands that have been purposely built to cope with the numbers, the hoard of proud unknowns will cram into any space they can find and put up with almost freezing temperatures; yet almost no one will complain. It would be, to use that tired old cliché, ‘un-Australian’ to complain amidst the back drop of these soaring hills, the same hills that denied our troops 92 years ago. Staring up at the rugged ridges from the beach, two monuments dominate the skyline. To the left and high above on what is known as the third ridge, is Chunuk Bair, the Kiwi monument which was built to pay tribute to the thousands of New Zealanders who lost their lives on the peninsula. The Kiwi troops who took this incredibly important post were amongst the only soldiers at Gallipoli to see the Dardanelles; the objective of the land invasions. Their monumental victory was brought undone only a day later when after they were relieved by supporting New Army Troops from England and the Turks were able to seize back the advantage. To the right is Lone Pine, where as Australians we hang our hat. In the eight months our troops spent clinging to the cliffs it was the only strategic position won and held by the allied forces at Anzac. The area which is approximately the size of two tennis courts was the scene for one of the bloodiest battles of the entire campaign. Hundreds on both sides were killed, many from hand to hand combat and by bombs that were thrown from enemy trenches just mere metres apart. Such was the bravery displayed by soldiers who for three days refused to withdraw and eventually held the crucial ground, that no less than seven Australian troops were awarded the Victorian Cross medal; the highest military honour. The monument at Lone Pine cemetery represents not just those who fell on the tiny piece of land; that now almost feels like Australian soil, but all those who fought and died on this far away shore. Just below and where I sat on that sunny April afternoon on the eve of Anzac Day is Shell Green Cemetery. This stunning clearing lined with lush green grass and flowers in full bloom sits amongst the harsh ridges and steep impenetrable cliffs that define Gallipoli. Until I reached this tiny plateau the feeling that I had expected, the overwhelming emotion I craved from this patriotic journey, had so far eluded me and the connection seemed almost forced. But in the solitude and silence I found at Shell Green Cem I discovered something I pray I’ll never forget. For reasons I can’t exactly recall I decided to tag along as two mates, two good souls I’d met less than a week earlier, headed for the cemetery to locate a grave of an ancestor. We left the masses relaxing just a stone’s throw from where the troops came ashore on that fateful day in 1915 and headed up Artillery Track which winds towards Lone Pine at the top of the ridge. We found Shell Green Cem deserted and the three of us strolled through the graves reading the names and messages on the head stones. We lingered in silence breathing in the history that seemed to hang heavy in the air. Shivers rippled through me as did the haunting breeze that tore across the cliff tops. Then without warning the grey clouds that had settled in my mind gave way and I, for the first time I understood why this journey has become so important. For everything I love about my country, has its origins right here: the camaraderie, the mateship, and the spirit so uniquely Australian was forged on this far away land and still flows through our veins today. The thousands that now converge come not to mourn the loss of a generation, but to remember, with banter and respect, those that fought under the banner of Anzacs. These brave young men may have paid the ultimate sacrifice for a futile cause, but in doing so, heralded the birth of a nation.